It was a nice risk-on party, but now is hangover time. Emerging Markets stocks, after some rough spots in 2015, had a great 2016 and an even better 2017. Last year, the MSCI Emerging Markets index soared 34%, outperforming even the S&P 500, which also had a great year, surging 18%. 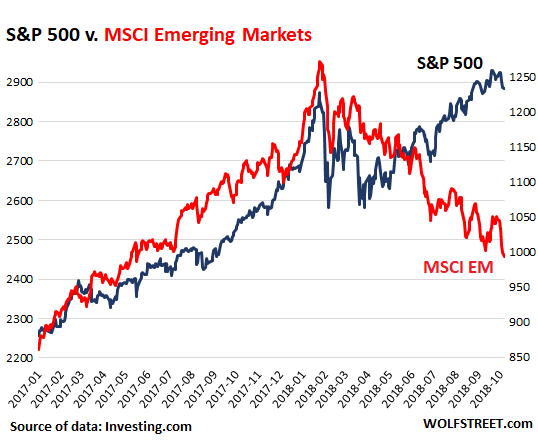 The Emerging Markets stock surge was powered by hot money from the Developed Markets, as the dollar had a terrible 2017, and glory was in the Emerging Markets. Then in January 2018, through January 26 to be precise, the MSCI EM index spiked another 10% to peak at 1,273. January 26 was of course also the day that the S&P 500 turned around and in subsequent weeks fell sharply, but has since recovered. However, the MSCI EM has continued to zigzag lower and since January 26 has plunged 22%, and is now back where it had been on May 10, 2017. In 2018, the Fed’s QE unwind has taken off in earnest. And the Fed has raised rates three times so far this year, with plenty more rate hikes lined up in the future. Higher yields have made the US Treasury market a lot more attractive – and that’s a good thing because the US Treasury Department is selling large amounts of debt to fund the ballooning deficits, and in fiscal 2018 added $1.27 trillion in debt to the existing pile, which needed to be absorbed by investors or else. 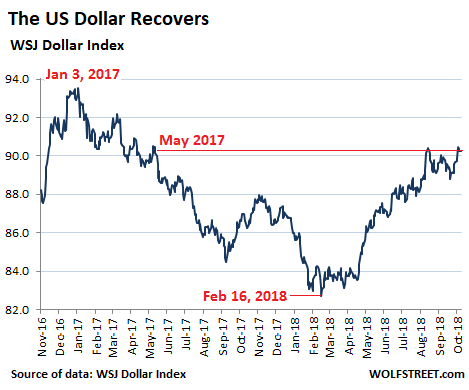 The WSJ Dollar Index tracks the dollar against the currencies of 16 major US trading partners, including the currencies of key Emerging Markets: Mexico, China, India, South Korea, Turkey, and Russia. Not included is the Argentine peso, which has totally collapsed against the dollar, similar to the Turkish lira. The chart below shows a range in the real effective exchange rate performance of 14 EM economies. Those with bad fundamentals, based on their twin deficit position (sum of budget and current account balances), have tended to experience large depreciations. This has been most acute with regards to Argentina and Turkey, but can also be seen in Brazil, India and Indonesia. Meanwhile, economies with more balanced positions such as Malaysia, South Korea and Thailand have weathered the storm better. To paraphrase Warren Buffett, the tide is going out and investors are starting to worry about which EM economies have been swimming naked (Chart via Lipper Alpha Insight). 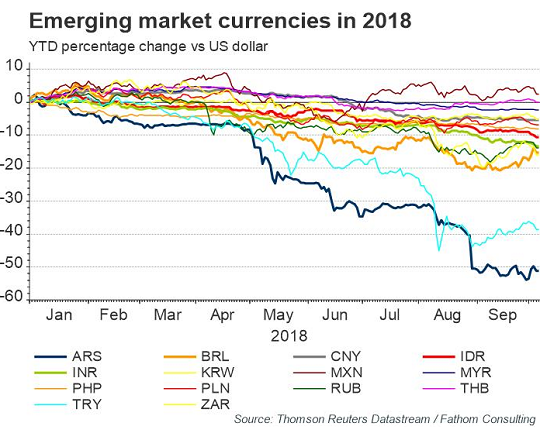 “The adjustment seen in emerging economies this year reflects a re-pricing of risk following a period of artificial calm due to easy global financial conditions,” Lipper Alpha Insight explains. But financial conditions are still easy, just not quite that easy anymore, and dollar borrowing is still cheap by historical standards, but has gotten more expensive, and euro borrowing too is now getting a little costlier, as central banks in the US, Europe, and Japan have started to pull back from QE and interest rate repression. And EM countries that have borrowed heavily in dollars and euros are now struggling with the burden of that foreign-currency debt, made much heavier by soaring inflation in their own currencies. This is particularly the case in Turkey and Argentina. Central banks have set out to remove some of these “easy financial conditions,” and have undertaken the first steps, mostly concentrated in the US, but they’re already having an impact, starting at the riskier end of the global stock market spectrum, with Emerging Market stocks, that folks in Developed Markets like to chase for big quick gains, and that now have to deal with a new reality.